Today I found out why school buses are yellow. An estimated twenty-six million students in the United States alone are transported to school every school day via bus—over half the student population in the country. 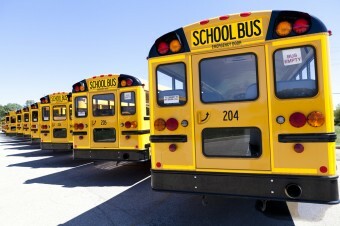 While school buses in countries outside of North America usually look like any other buses, North American school buses are distinctive for their yellow colour. It wasn’t always that way. The first school buses were horse-drawn carriages known as “school hacks” or “kid hacks.” They were being made by Wayne Works starting around 1886, though it’s possible they were around earlier. However, you probably wouldn’t see teams of school hacks in every American town; many children had to rely on walking (uphill both ways through a snow storm…), farm wagons, or sledges to get to school. In 1914, with the popularity of automobiles rising, Wayne Works moved on to automobile chassis, allowing eager students to get to school faster. With these “buses” students would sit on the perimeter of the bus facing inward rather than toward the front. Afterwards, the Blue Bird Company began constructing a design for a bus that more closely resembles the buses that we know today, though they still had a long way to go. In the 1930s, school buses underwent a series of standardisations. Before this time, school buses were mostly vehicles that had been repurposed as a mode of transportation for a number of students to and from school. A “California top” design—the rounded roof of the bus—patented by Gillig Bros was widely used, but parents were still worried about school bus safety and there was interest in standardizing the way that children got to and from school. In 1939, Dr. Frank Cyr rose to the occasion and organized a conference at the University of Manhattan in order to develop school bus standards. Prior to this, he had travelled the country observing the various types of school buses in use and safety precautions that they used, if any. The conference was funded by a $5000 grant (about $81,571 today) from the Rockefeller Foundation and attracted transportation officials from all 48 states in the Union at the time. The result of the conference was 44 national standards for school buses being developed. One of these standards was school buses should be “national school bus glossy yellow”. Initially called “national school bus chrome,” the colour was chosen because of its attention-grabbing qualities. It gets noticed faster than any other colour. For instance, in one’s peripheral vision, studies have shown that humans notice the colour yellow 1.24 times faster than another eye-catching colour, red. Yellow is also particularly visible in the early morning and evening light, when school buses usually operate. The hope was that people would see the colour of the bus quickly and know to slow down and be mindful of the children on board, being dropped off, or picked up. Thirty-five states within the U.S. switched to painting their buses this colour soon after the conference, as did certain regions of Canada. But it wasn’t until 1974 that all school buses in the United States were painted this colour. You can’t buy a bus that doesn’t meet that [colour] formula… If they had to do it today, who knows if it would be the same, because now they have brighter, more noticeable things. Think of the vests highway workers wear. Obviously, they’re even more noticeable than national school bus chrome yellow. But the rationale for maintaining that color is its universal acceptance. We’ve all been born and raised knowing what that is. With all this talk about safety on school buses, you might be wondering why there aren’t seatbelts on most of them. (School buses weighing less than 10,000 pounds are required to have them, but they are usually the only ones, aside from the fact that the driver’s seat always has a seatbelt.) In a nutshell, the reason school buses don’t have seatbelts is cost, the fact that school buses are already amazingly safe, and research to date has shown that adding seatbelts doesn’t actually make school buses definitively safer, and in some scenarios actually increases risk of injury to the child. For alternate safety measures, the intentionally closely spaced seats (the bane of the knees of tall students) are extremely shock-absorbent and able to protect children effectively enough according to studies by the National Transportation Safety Board and National Academy of Sciences. Essentially, the seat design and spacing more or less functions as a “protective envelope” around the child. School buses are also some of the largest vehicles on the road and they aren’t typically driven very fast, further helping make them safe without seatbelts. Of course, the seats won’t do much if the bus tips over on its side. But it would cost an estimated $800 million to outfit every school bus in the U.S. with seatbelts. And the problem is actually a little worse than just the installation cost. Because school buses are built to accommodate five year olds on up to the late teens, a seat that would have otherwise been able to safely fit, say, three seven year olds, would only be able to have two seatbelts to make sure the seatbelts work on a hefty 18 year old too. This would mean increasing the bus fleet size in the United States by an estimated 15%, along with all the continuing costs associated with that. If cost were the only factor, it still might get pushed through as “think of the children” is every politician’s favourite expression for getting expensive things done, whether the thing proposed is a good idea or not (or in some cases whether it actually has anything to do with children or not ;-)). In this case, they could even trim off most of the upfront cost by simply requiring that all new school buses have seatbelts, then over the decades the seatbeltless buses would be naturally phased out. The new buses would cost a titch more due to adding seatbelts, and you’d still have the extra costs from needing more buses, but close to $800 million in savings is nothing to sniff at. From a practical standpoint, there is also the difficulty of a bus driver making sure all the kids are wearing their belts in the first place and that they keep them on. The bus driver would also need to verify that the kids are wearing the seatbelts correctly at all times (incorrectly worn seatbelts pose a definite injury risk in an accident). Beyond this slowing down transportation times, it’s generally considered better that the bus driver is spending the majority of their time paying attention to the road instead. In the end, as the National Highway Traffic Safety Administration noted with their research on the seatbelt issue going all the way back to 1987, all evidence points to that there is little, if any, benefit to including seatbelts in large school buses. The National Association for Pupil Transportation, the National School Transportation Association and the National Association of State Directors of Pupil Transportation Services all concur with this assessment based on their own research. Instead, they all prefer to create “egg carton” safety envelopes that require the child to do nothing but stay in their seating area to keep them safe. It seems to be working. Despite it being the number one way kids in the United States are transported to and from school, only about six students die per year in school bus crashes in the U.S. out of a total of about twenty-six million children transported throughout the school year. For comparison, a little under one thousand kids die every year in the United States while walking, biking, or being driven to or from school in a car. One of the founders of UPS originally wanted the trucks to be yellow, instead of brown. He was eventually convinced to make them brown by Charlie Soderstrom. Soderstrom pointed out that yellow trucks would be impossible to keep looking clean. Railroad cars are often brown for this same reason. “School bus yellow” is actually used in Europe for many mail and other services (some of which used the colour long before it was associated with school buses in the US). Sweden used it for their postal service between 1923 and 1991, and it was also a popular colour choice for post services in Germany and Switzerland. It’s used in Hungary on some buses and coaches. As for other school buses, a few school districts in the UK have adapted the colour for their own buses. School Bus Yellow is recorded as Federal Standard No. 595a, Color 13432 with both the National Highway Traffic Safety Administration and the National Institute of Standards and Technology. So the answer was exactly what I thought it was? That yellow is a noticeable color? I’ve found a good way to read your articles. Skip to paragraph 6 for the answer, then read the rest of the fluff if I want to. You find interesting topics, but slow and painful deliverability. Was the topic and the answer interesting? Yes, actually. Very interesting. I totally get you. This site has such great topics, but it’s also soooo DRY! School busses should have seat belts. for the first five years of a kids life they are always buckled up. First in their car seats and as they grow regular seatbelts, responsible parents won’t put the car in gear until everyone is buckled up for safety. Then on their very first day of school they learn that their own parents have been lying to them their entire life and that seat belts are not necessary at all. Did you actually read the article, or are you just stupid? It described HOW DIFFERENT the interior design of a school bus is compared to a car, and how it is bigger and slower, leading to reduced injuries by design, and posing the likelihood of injuries being caused by seatbelts in such vehicles. So, there is no conflict, and children are not being taught seatbelt are “not necessary at all”. They are probably smarter than you, and will understand that different circumstances call for different safety measure. In 1932 Crown designed and the built the model of bus that everyone else copied. Gillig copied them. Blue Bird tried to claim the first transit style , door behind front axle, design until we set them straight. Crown did that. Gillig even borrowed and paid Crown to use their side mounted radiator design for midship engines. Anyways…even tho my bus is national chrome yellow….people are still blind to it. They don’t care that there are 78 little angels on it, they still cut me off. They don’t care kids are about to get off and cross(escorted across by the driver cos California is adamant about student safety)….people still run the red lights and flashy stop sign! What part of Stop When Red Lights Flash do people not understand? So yep people see schoolbus, bright yellow or not, don’t care and drive worse around them. Maybe that’s a New York thing? I don’t know.